Etiology: C. parasitovorax is a small, noninvasive fur mite of rabbits. Incidence: Uncommon in research animals. Distribution: Can be found over the entire body, but tend to concentrate in particular areas. Cheyletiella parasitivorax is most numerous in the intrascapular region. Clinical Signs: None usually observed. C. parasitovorax infestation may result in fur falling off in clumps with erythema and flaking of underlying skin. Pruritis is uncommon. 1. Pluck or brush hairs and examine subgrossly (dissecting microscope) or microscopically for mites or eggs. 2. Run cellophane tape against the grain of the fur, place on a slide, and examine microscopically for mites or their eggs. This method is not very reliable for detection. 1. Place pelage (fur) samples collected in a Petri dish. As the pelage cools, mites will migrate towards the tips of the hair shafts and be visible with a dissecting microscope. 2. Place pelage samples on black construction paper. 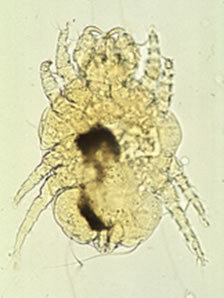 As the pelt cools, the mites will crawl away, and be visible as white specks on the black background. *Be sure to ring the edges of the construction paper with double stick tape, so that the mites do not escape the area. Motile mites may be evident and have been described as “walking dandruff”. Diagnostic Morphology: Mites are ovoid or saddle-shaped with large palps (palpal claws) and pedal combs (tenent hairs) on each leg. Public Health Significance: This parasite can cause a transient pruritic rash in hypersensitized people, especially children.